Now you can cook without oil or fat in a healthier, more delicious way, retaining all the full flavour of your food. Ideal for using outdoors, on our gas burners or on wood or coal. 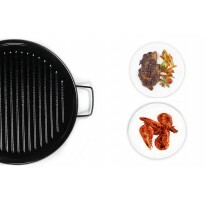 The handles have a heat diffusing design that prevents burning. These thick Enamelled Cast Iron Griddles keep the heat for a long time, allowing you for a perfect roasting. 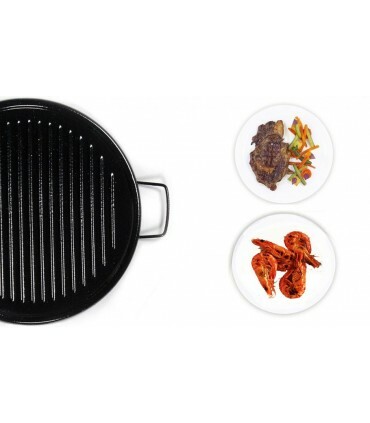 Our griddles have a flat side to cook fish, and a corrugated one, specially designed to keep away the fat while cooking meat. Take this product to the table using our adjustable place mats. The coating of enamel helps to an easy cleaning and maintenance of griddle. For more information on care and cleaning please see the "Care Instruction" tab. 5 estrellas. La verdad es que estamos muy satisfechos con la compra, es una excelente y limpia alternativa a la clasica barbacoa con carbon o leña, complementa nuestro paellero a la perfeccion, tiene casi un dedo de grosor y eso facilita que el calor se reparta uniformemente y da la sensacion de que tengo plancha para muuuchas barbacoas, por ultimo es reversible con una parte lisa y otra ondulada lo que permite sacar el maximo partido tanto en pescados como en carnes, genial! !